The red 6-Cell D White Star Flashlight from Maglite is a rugged, high-intensity incandescent flashlight. It features an anodized aluminum construction that is corrosion, water, and impact resistant, and has a spot to flood adjustable beam with cam action focus. It is powered by 6 D batteries with a runtime of 11 hours. This flashlight is an excellent choice for a combination of rugged durability and the dependability that Maglite is known for. Box Dimensions (LxWxH) 21.1 x 4.6 x 1.1"
6-Cell D White Star Flashlight (Red) is rated 5.0 out of 5 by 6. Rated 5 out of 5 by Larry from Reliability, performance, and endurance I bought this Maglite flashlight for the purpose of having a reliable flashlight that can perform with endurance and unparalleled quality - upon opening the carefully packaged order from B&H, I had just that. In fact, I even bought a LED bulb for it which has increased the quality that already well above average. The 6-Cell D is indeed a powerful tool - and it is more than just a flashlight as the average flashlight isn't water resistant, backed by a 10 year warranty, and built out of aluminum. The size of the 6-D Cell is enough to use it as a defensive weapon in serious events and to even use to shatter a car window in the event of an emergency such as if the car were to submerge into the water. This flashlight is better than I expected, and I honestly cannot think of anything to complain about regarding it. 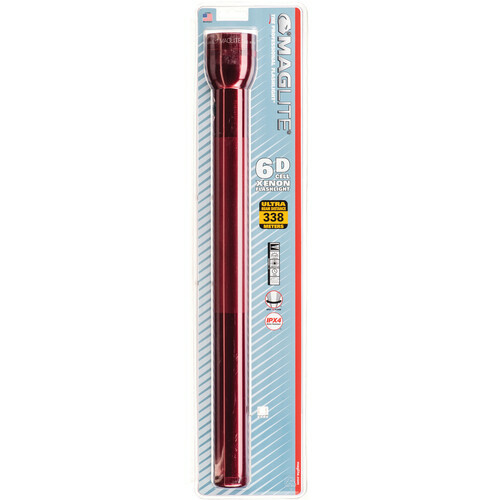 Yes, it is very long and takes 6 D batteries, but with that many batteries you are guaranteed to have plenty of lighting. Rated 5 out of 5 by LiteEmUp from Big and bright Love this thing! Not only will it light your way, but it's big and heavy and could be used for self defense (if the need should unfortunately arise). Looks great and is very durable, just as a Maglite should be! Rated 5 out of 5 by machinefever from Still the Best The most durable flashlight you will ever own. Rated 5 out of 5 by Brucej from Still the Best You can never go wrong with any Mag Light. Rated 5 out of 5 by balls from greatest flashlight ever! it bright its greatest!